Follow-up: SciWiki has a page about beagle usage: How to Beagle. Illumina’s methyl-seq and other methylation methods? Action: Should we create a co-working poll asking people around? A lot of different groups forming/established. How to integrate or not? Follow-up: COOP is working on integrating groups with similar insterest (bioinformatics and data science) . 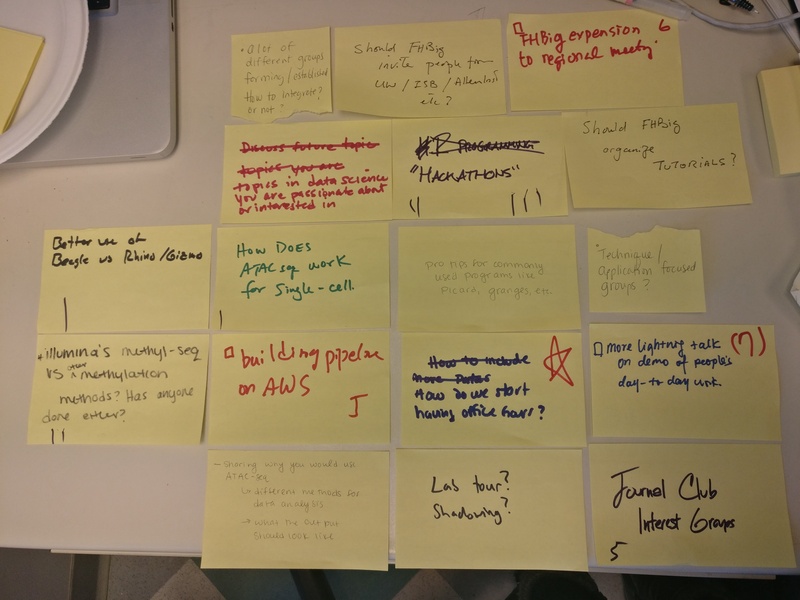 Follow-up: SciComp/Sam/Amy/Jenny huddle up to build workflow on AWS using scientific workflow engine. Should FHBig invite peple from UW/ISB/Allen, etc? Follow-up: We already have members from other institution. Please invide people who are interested in FHBig. Follow-up: The COOP is hosting a community-focused NCBI-style Hackathon in February. Propose a project here. Follow-up: We will start our first journal club on Feb. and discuss DNA-seq data. Please make proposal on slace so that we can keep the journal club going. How do we start office hour? Organize pop-up workshops for day-to-day works and journal clubs. But what specific topics should we cover? Please post requests on #co-working-poll or even #general channel on slack and we can ask local experts to help us. It is highly encouraged to create an interest and co-working group of your interest. The blog post, How to Start a Co-working Group, suggests the tactics and resources.